The University of Connecticut Systematic Research Collections are administered by the department of Ecology and Evolutionary Biology at the University of Connecticut in Storrs, CT. The Collections house natural science specimens for the people of Connecticut and the greater academic and conservation communities globally. The purposes of the Collections are to preserve representatives of the Earth’s biota, for qualified persons to use in teaching and research, and to provide a repository for type specimens from taxonomic studies, or for voucher specimens from natural history surveys or molecular, behavioral or ecological studies. The Collections include a wide array of taxa, with particular emphasis on verte brates, invertebrates, fossil and living plants, and fungi. With respect to geographic coverage, the Collections emphasize Connecticut and the adjacent northeastern states, but include specimens from around the world. Geographic emphasis varies with each collection. Electronic databases, a website, and a library of pertinent literature are maintained. Research in the collections is undertaken by collection staff, faculty members, and students of the University of Connecticut, and by scholars either visiting the Collections or borrowing their holdings. A. By answering written or verbal research inquiries or general questions. B. By lending materials to qualified individuals, institutions or their representatives, for research, education or exhibit purposes. (See also Section VI below). C. By providing and supervising physical access to the Collections themselves. Access to the Collections is limited to authorized Collections personnel, authorized students, visitors, research associates, and volunteers. In addition, every attempt will be made to accommodate the community. Special visits may be arranged when appropriate Collections personnel are present to supervise the visitor(s). Visitors will generally not be admitted to the Collections without an appointment. Curators /collection managers should be contacted in advance by faculty members who wish to visit the Collections with a class of students. A. Collection Personnel: Authorized collection personnel are the collections managers and designated faculty curators. Collection personnel are identified by the Head of the Department of Ecology and Evolutionary Biology in consultation with the departmental Collections Committee. C. Visiting Scholars: Scholars wishing to visit the Collections to conduct research should make arrangements in advance with a collection manager or curator. Visiting scholars should be familiar with specimen handling protocols. D. Research Associates: The Collections Committee will make recommendations to the Head of Ecology and Evolutionary Biology, who will decide whether or not to invite a scientist to become a Research Associate. A Research Associate is expected to contribute to the goals of the Collections as well as to perform research on specimens in the Collections. E. Volunteers: The Collections Committee will interview potential volunteers. Volunteers will work under the direct supervision of the appropriate curator/collection manager. F. Visitors: Visitors are welcome to view the Collections when accompanied by Collection Personnel. 1. To strengthen Collections areas in which there is current research specialization and/or historical interest (consistent with the accession policy below). 2. To broaden the comparative base of established collection areas. 3. To broaden representation of northeastern United States taxa, especially Connecticut, for identification and research. 4. To provide a permanent repository for type and/or voucher specimens. 5. To provide a permanent repository for specimens collected in survey work. 6. To provide a collection that will stimulate and enhance the educational environment of the University of Connecticut. 7. To promote availability of specimens and their associated data and images to qualified individuals. The University of Connecticut Systematic Research Collections acquires specimens to strengthen existing holdings, particularly in areas of present and projected research, and in areas of taxonomic and geographic strength and/or importance; to broaden the comparative base of existing holdings; to accept type specimens and voucher Collections; and to enhance teaching. Specimens are acquired by field collection, exchange, gift, bequest, or purchase. The University is not under any obligation to accept materials offered. Specimens or other materials with restrictions that would prevent effective research use, normal exhibition use, loan or disposal will not be accepted. All donations must be accompanied by a Deed of Gift (sample attached), clearly stating the following: “In donating these items to the University of Connecticut, the donor hereby transfers ownership to the University and agrees that the items may be integrated into existing Collections or used in any way.” The material must be the legal property of the donor. Donated specimens may be labeled or stamped to acknowledge their origin. Acquisitions or portions of acquisitions that are not intended for the permanent Collections may be retained for use in teaching or in exhibits, or for exchange. All specimens acquired for the permanent Collections will be accessioned in a timely fashion according to accession procedures appropriate to each collection. Specimens will be acquired only when they have been obtained in full compliance with laws and regulations of their country of origin, and also with Federal and State laws and regulations, including the Endangered Species Act and the Convention on International Trade in Endangered Species of Wild Fauna and Flora. No staff member will make, expand or revise personal specimen Collections in their own discipline while on University time. A. Field collection: Unless other institutional or governmental agreements pertain, ownership of a specimen commences with its collection. Specimens collected in the field by curators/collection managers, staff members and students affiliated with curators during Collections- or university-sponsored trips, and including Collections obtained under grant funding, and their associated documentation, are the property of the University of Connecticut. B. Gifts/Bequests: The University is considered to own a collection when a Deed of Gift form has been executed legally and when the object(s) physically enter the Collections. C. Exchange: Ownership commences when all specimens/objects involved have entered the respective institutions and terms of the exchange agreement have been fulfilled. D. Purchase: Ownership commences after the University has paid in full. No member of the staff will give appraisals for any purpose, including tax-deductible gifts offered to the collections. b) commits the University to the responsibility of properly caring for the object/specimen. Methods of accession vary with each collection according to professionally recognized standards. De-accessioning is the process of removing an accessioned object/specimen from the permanent collection by legal means. Objects shall remain in the Collections as long as: they retain their physical integrity; they retain their authenticity; they continue to be relevant and useful to the purpose and goals of the combined systematic research Collections; they can be properly stored, maintained and used. De-accessioning may take place through gifts and exchanges or through disposal. Specimens may be de-accessioned for one or more of the following reasons: to carry out beneficial exchanges with other systematic research Collections and scientists; to cull material that has little scientific, cultural or educational value; to permit destructive sampling (see below); to remove material that has deteriorated beyond usefulness; or to remove material that may be hazardous to health and safety. Priority for disposition of de-accessioned material is as follows: to the teaching Collections; to other departments within the University, or to another educational or scientific institution. De-accessioned material may not be transferred by any means to curators/collection managers, staff, research associates, or their families or representatives. Loans are temporary physical transfers of specimens or objects from one institution or individual to another where there is no transfer of ownership. The combined systematic research Collections make or receive loans for the purpose(s) of research, exhibition or instruction. Loans are made by a curator/collection manager. Sample loan forms are attached. 2. Outgoing Loans Requests from institutions or individuals outside the University of Connecticut to borrow specimens or objects should be made to the appropriate curator/collection manager. Requests should include the purpose of the loan, a detailed description of the material requested, where the specimens will be housed while on loan, and the name and address of the person under whose responsibility the specimens will be while on loan. Only under exceptional circumstances will loans be made to individuals without institutional affiliation or sponsorship. Some specimens are not available for loan, including specimens too fragile or expensive to ship, and specimens needed for teaching/research/exhibition at the University of Connecticut. Single representatives of taxa are not usually loaned. The University will not loan items to institutions, individuals or organizations that previously have failed to follow our loan policy and its stipulations. A. Loans are made for the length of time indicated on the loan form. Loan length does not normally exceed one year. Requests for extensions should be made to the appropriate curator/collection manager. B. Specimens on loan should be housed securely and according to professional standards. Specimens should be protected from extremes of temperature and humidity, and from insects, vermin and dirt. Special arrangements may apply to specimens loaned for exhibition. C. Loaned specimens may not be transferred or forwarded to another individual or institution without the written permission of the appropriate curator/collection manager. Loans to students are made to the student’s faculty advisor. D. Specimens or other materials should not be dissected, prepared, molded or otherwise replicated, remounted, reframed, repaired, coated for scanning electron microscopy, fumigated, or in any way altered without prior written approval from the appropriate collection manager/curator. (See also Policy on Destructive Sampling, below). E. Exchange or permanent retention of duplicate specimens is sometimes permitted, by written arrangement with the curator/collection manager. F. Documentation (labels, catalog or accession numbers, bar codes, etc.) must not be removed, altered or discarded. G. The borrower must agree to cover the cost of return shipping, and any special packaging necessary to assure safe return of the loaned material. H. Annotation or determination labels should be applied (collection-specific guidelines pertain). I. The University of Connecticut, Department of Ecology and Evolutionary Biology, should receive credit in exhibit labels, catalogues, and publications based on the use of specimens from its Collections. The appropriate, collection-specific acronym should be used to cite the University’s specimens. Authors are asked to send at least one copy of any publication based in whole or in part on material loaned by the University. : All material borrowed by faculty, students or collection staff of the University of Connecticut is the responsibility of the institution. Borrowed material should be clearly identified as such, and housed according to professional standards in designated cabinets. All associated documentation, including correspondence and loan forms, should be placed in a clearly marked file folder so that specimens could be returned should the borrower be unable to return them. The lending institution should be clearly indicated on each specimen (collection-specific guidelines apply). Loans to students are the responsibility of the student’s faculty advisor. The combined systematic research Collections welcome and promote research on their holdings, consistent with the preservation and protection of their material for the use and enjoyment of future generations. Requests for destructive sampling will be considered when the potential contribution to science outweighs the defacement or loss of a specimen. Requests for destructive sampling must be made in writing, and will be evaluated against the following criteria: the purpose and merit of the study; the appropriateness of the proposed analytical technique(s); the demonstrated competence of the researcher; the potential to compromise future study; the availability, or rarity, of equivalent material; and the proposed dissemination of results. Special consideration pertains to type specimens, or other items of significant scientific or cultural value. Proper association of the sampled specimen and its parts is essential (collection-specific guidelines apply). All users of information generated from specimens in the Biodiversity Research Collections should acknowledge the Collections as the source of such information. An integrated pest management system for the combined facility has been implemented, with emphasis on prevention of infestation. All incoming specimens except slides, fossils and fluid-preserved specimens, will be bagged or boxed and frozen before being placed into the main storage room. Spot checks of all Collections will be carried out twice a year. If pests are found, the affected cabinet will be emptied and thoroughly vacuumed; all specimens in the cabinet will be bagged or boxed and frozen before being refiled. Additional, collection-specific procedures may also apply. Sticky traps placed in strategic locations throughout the facility are used to monitor live insect activity. All staff must be on constant alert for signs of pest activity. In keeping with University policy, no pets, including fish, birds, dogs or insects are allowed in the collection facility at any time (with the exception of guide dogs for the visually impaired). The facility must be kept as clean as possible. Debris should not be allowed to accumulate on countertops, shelves, or floors. Refuse must be disposed of in appropriate receptacles, and removed from the facility regularly and promptly. The facility is divided into zones, with restrictions as to the activities undertaken within them and the materials brought into them. The following zones will be designated: Red Zone, Yellow Zone, and Green Zone. Red zones are used solely for collection storage, and are the most strictly controlled areas in the facility. All incoming specimens must be unpacked, inspected and treated if necessary to ensure that they are pest-free before being brought into a red zone. No unopened boxes, packing materials or other non-Collections items may be stored in a red zone. Items such as briefcases, backpacks and coats are not permitted in a red zone. Live plants or animals are not permitted under any circumstances. No food or drink is allowed in a red zone. Doors should be kept closed except for access. 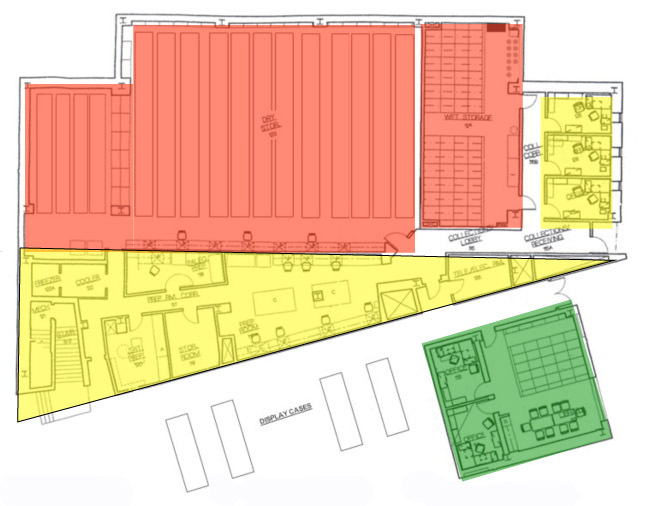 Yellow zones include staff offices, the common preparation room, and the support and storage rooms off the common prep room. All incoming packages must be unpacked, inspected and treated if necessary immediately after being brought into a yellow zone to ensure that they are pest free. Packing materials and other non-specimen collection items must be stored in a neat and orderly fashion, and in such a way that it is easy to clean around them and inspect for pests. Live plants and animals are not permitted, nor are decorative items that could harbor or attract pests. Food and drink may be brought into yellow zones with the approval of the appropriate curator/collection manager. Food should be in well-sealed containers, and must not be stored. Food remains and wrappers should be discarded in a designated sealed bin immediately after a meal. Green zones include the library, kitchenette, and visiting curator offices. Food and drink are allowed. Food should be in well-sealed containers, and stored only in a designated area of the kitchenette or the refrigerator. Cleanliness must be maintained. Potted plants may be permitted as long as no standing water accumulates underneath them. Specimens can be brought from the main dry storage room (red zone) into the yellow zone (common preparation room) without the need for being refrozen before being put back. Alternatively, specimens that need to be compared to specimens in the dry storage room can be frozen and then brought into the dry storage room for comparison. Any specimen leaving a yellow or green zone must be frozen before being placed back into the collection storage room.